A colorful, friendly and relaxing environment created with one purpose in mind: your wellness. In La Placita you’ll find special food and bath souvenir products designed around the Sea Salt, our oldest industry on Bonaire. 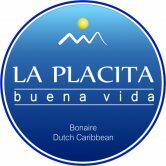 Their motto is Buena Vida (Good life), and is a motto they fulfill by pampering you with exfoliations, massages, Colombian Coffee and Halo Therapy. Bonaire is famous for diving, but at La Placita you’ll have a very different interaction with fishes, in the “Garra Rufa” sessions. Garra Rufa are small sweet water fishes that nibble away the dead skin cells of your feet in a gentle and relaxing manner.